This weekend was a milestone in my life. My husband turned 30 and we celebrated 10 years since we met in person for the first time. These 2 important events have got me to thinking about how we evolve our personalities as we grow. This evolution usually relates to the public through your wardrobe. I often discuss the fact that you dress on the outside the way you feel on the inside, but the opposite is also true. To make yourself feel a certain way, you can dress your way to that feeling. Clothing yourself is a very psychological process that can show you to yourself, just as much as it reveals your personality to others. My husband asked me to make him a vest for his birthday. 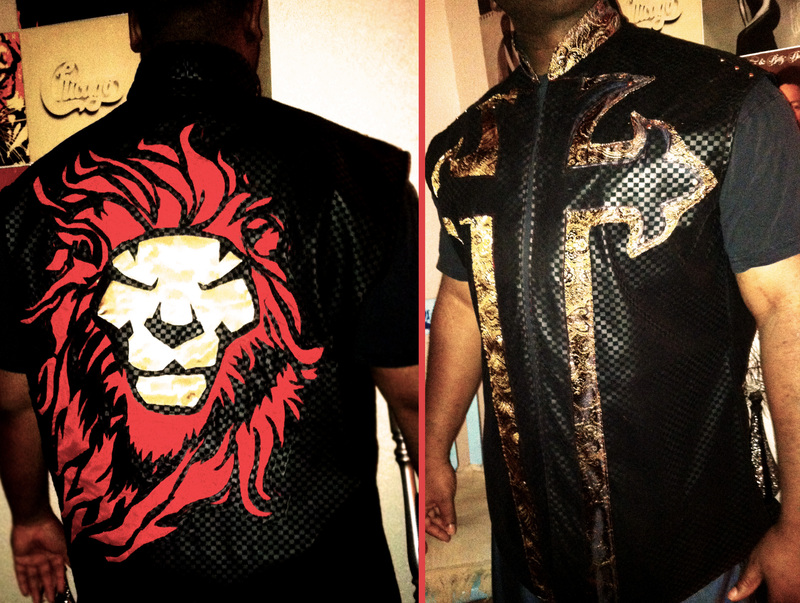 He said “I feel like a lion lately.” So he wanted a lion on the back of his vest and a cross on the front. 2 days later, his prestigious lion vest was done. He put it on and instantly his posture and attitude changed. He said he felt like it represented the moment for him. He felt like the vest showed wisdom and strength, which in turn added to the internal feeling that he had about himself.